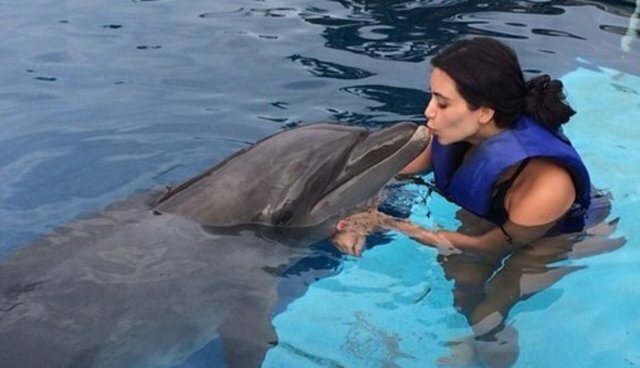 Reality star Kim Kardashian recently took to her Instagram to flaunt photos of herself swimming with and riding dolphins at a marine park in Mexico. Twitter was immediately -- understandably -- ablaze with reactions, many of which were calling on Kardashian to stop supporting dolphins in captivity (for information on the problems associated with swim-with-the-dolphins program, see here). You can urge Kardashian to stop supporting dolphin captivity by signing this Change.org petition, and tweeting your support below. Swim-with-the-dolphin programs -- and dolphin captivity in general -- not only induce unnatural behaviors in dolphins and whales, but also endanger trainers and visitors. Join us in calling on Kim Kardashian to stop supporting dolphins in captivity.